Tuolumne Meadows Campground is a popular camping spot in an awesome section of Yosemite National Park, with convenient amenities, many outdoor activities and Yosemite sights and attractions galore. Book Online. Tuolumne Meadows is a beautiful area of Yosemite National Park, and camping is available at the Tuolumne Meadows Campground. You can bring an RV or tent and camp from July to late September. There are numerous hiking trails nearby as well as rock climbing and fishing. Tuolumne Meadows Campground Yosemite is easily accessible from Highway 140. From this highway you take Big Oak Flat Road and travel to Tioga Road, turning right. It’s a 40-mile drive to the campground. Tuolumne Meadows camping requires reservations for half the campsites, the others being first-come, first-served. Reservations are recommended. Call 877-444-6777 or Book Online. 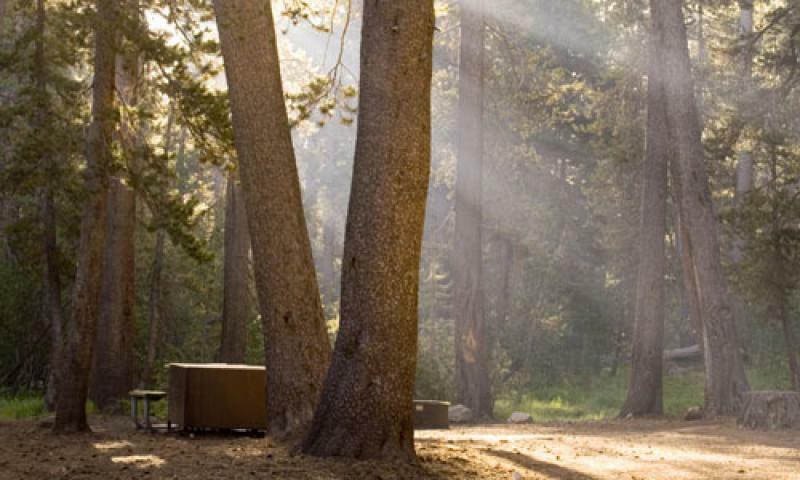 Yosemite Tuolumne Meadows Campground is the perfect location to experience some of the best of Yosemite. You can see vistas of the Cathedral Range from Tuolumne Meadows, as well as Mount Dana and Lembert Dome. There’s nothing like relaxing and taking in the views! Two major trails run through Tuolumne Meadows, the Pacific Crest Trail and the John Muir Trail. Hiking and backpacking from this location is excellent! You can even make your way to the summit of Mount Lyell, which is the highest peak in the park. With a number of major domes and many smaller ones, rock climbing close to the Tuolumne Meadows Campground can’t be beat. Climb Stately Pleasure Dome, Lembert Dome, Tenaya Peak and many more. Wild trout can put up a good fight, but that’s the greatest fun for an angler. Probably the best place to fish near Tuolumne Meadows is at the Lyell Fork. You can park in the parking lot for the Pacific Crest Trail and take the trail to the river. Find brown trout in abundance here. You can also try the Dana Fork, near Tuolumne Meadows Lodge.